Goa : Former CM of Goa Pratapsingh Rane inaugurated three days South Asia Media Summit at ICG, Goa. 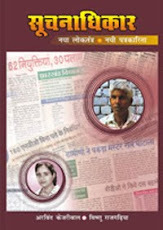 He lso released ‘A handbook on RTI” written by Vishnu Rajgadia and Nandini Sahai. The book has been published by MICCI, FES and UNESCO. The summit has been organised by the Friedrich Ebert Stiftung (FES-India), Media Information and Communication Centre of India (MICCI) and The International Centre Goa (ICG) from 16 – 18 November 2007 at the premises of ICG in Dona Paula. The theme of this year’s summit is- MEDIA AND PUBLIC INTEREST IN SOUTH ASIA. This is the third annual summit to be organized in collaboration with the ICG in Goa . Shri. Bhaskar Ghose, CEO, Lok Sabha TV delivered the Keynote Address to the Summit. Shri. M. Rajaretnam, Director, ICG welcomed the participants. Shri. Rajeshwar Dyal, Senior Media Advisor, FES-India; and Smt. Nandini Sahai, Director, MICCI delivered their lecture regarding the theme of the summit.